Photo from Nigella.com; I always eat this too quickly to remember to photograph it! It isn’t often that I find a vegetarian recipe that I instantly fall in love with. Often finding them too sweet, too meagre or too dull, I usually end up taking my inspiration from meat based recipes. 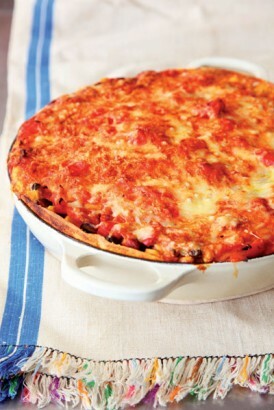 Nigella Lawson’s Mexican Lasagne is an exception. It is absolutely amazingly delicious. No lie. It uses tortillas in place of traditional lasagna sheets, layered up with black beans, sweetcorn, chili, cheese, and salsa. Served with a mound of homemade guacamole this is the stuff of mid-week dinner dreams. And, what’s more, any leftovers make the most amazing lunch ever. What are your best recipe finds? Anyone ever tried this mexican mash up? P.S: I use smoked cheddar in place of the suggested goats cheese, I omit the coriander (it is the Devil’s food after all), and I also double the chili ration, as I love a good kick of heat. You’ve convinced me! Like the idea of smoked cheese instead of goat’s cheese too – I love both but generally prefer goats cheese in dishes where it doesn’t have to compete with other fronty flavours. Off to check the NIgella link.. I tried making this last week and it’s really REALLY good 🙂 I liked it best cold for lunch the next day!